Now at its 99th edition – but older than any other bicycle race, having been first run in 1876 – Milano-Torino NamedSport is 142 years old. This year the race will start from Magenta, a city in the Milan municipality, to end, like the most recent editions, on the Colle di Superga climb in Turin, which is to be climbed twice, after 200km. 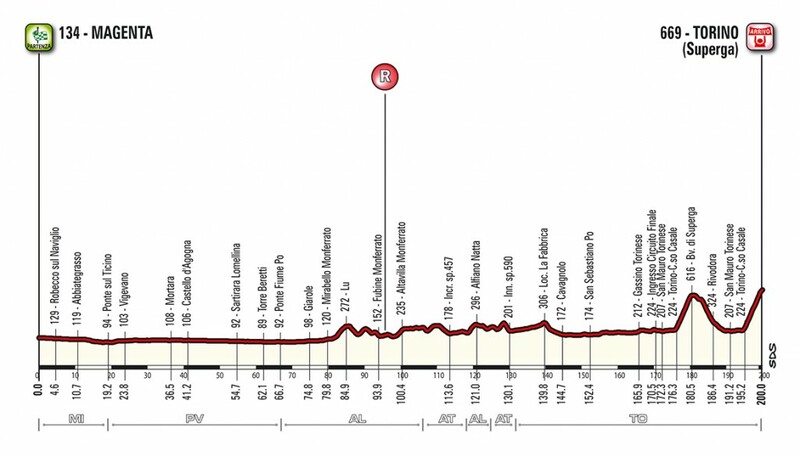 The route starts in Magenta and rolls across the Po Valley along flat roads, all the way through the Abbiategrasso, Vigevano and Lomellina plains, up to the Monferrato, where the race profile becomes wavier, with gentle climbs and descents with some punchy short climbs (such as Lu, Altavilla Monferrato and Alfiano Natta) that lead to the final circuit. The route rolls past San Mauro Torinese and all along the Po River in Corso Casale, where it takes in the first climb to the Basilica of Superga. The road then drops down into Rivodora on a technical descent (diverting 600 metres before the finish) that leads back to San Mauro. Here the route goes up again, all the way to the finish, with gradients exceeding 10%. The last 5km (to be covered twice, with the exception of the final 600m) start in Torino, in Corso Casale, at the foot of the climb that leads to the Basilica of Superga. The average gradient is 9.1%, with a mid-climb peak of 14% and long stretches featuring 10% gradients. There is a left-hand U-turn 600m before the finish that leads to a short 8.2% climb, with one last bend 50m before the finish.